Carrog is a village on the banks of the River Dee, near the town of Corwen, in the county of Denbighshire. Until 1974 it was in the historic county of Merionethshire and, between 1974 and 1996, in the county of Clwyd. 624817 8th Bn. Canadian Infantry (Manitoba Regiment) 21 Sep 1917 19 Son of the late William Thomas Davies & Marie Davies of Carrog. Aix-Noulette Communal Cemetery Extension, Pas de Calais, France. 150915 Royal Garrison Artillery (153rd Siege Bty.) 20 Sep 1917 28 Son of Hugh and Mary Hughes, Bryntangor Farm, Bryneglwys, Corwen. 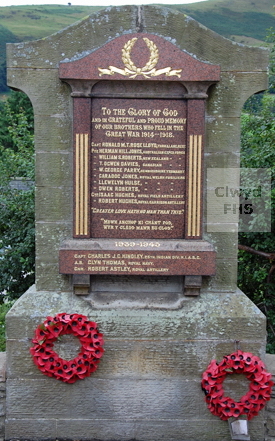 Also named the Coedpoeth and Corwen War Memorials. Outtersteene Communal Cemetery Extension Bailleul, Nord, France. 203440 1st/4th Bn. Royal Welsh Fusiliers 10 Jul 1918 22 Nephew of David & Jane A Jones, of Cilymaen Llwyd, Carrog. Born Manchester, England. Carrog Baptist Chapel Cemetery. 9050 3rd/4th Bn. Royal Welsh Fusiliers 11 Aug 1915 28 Son of William & Jane Jones of Berwyn Street, Carrog. St Ffraid's Churchyard, Carrog. 1096 13th Bn. Australian Infantry, A.I.F. 30 May 1915 24 Son of Mrs Jones, Dee View, Carrog. Emigrated to Australia, aged 19. Lone Pine Memorial, Gallipoli, Turkey. Buried at sea. Ronald Madoc Tierney Rose 2nd Bn. York and Lancaster Regt. attached 3rd Bn. Kings African Rifles 19 Sep 1916 32 Son of Major John & Mrs. Sophie Rose Lloyd, of Rhagatt, Corwen. Born Pontefract, Yorkshire, England. Morogoro Cemetery, Tanzania. 77595 19th Bn. Royal Welsh Fusiliers 7 Jul 1918 20 Son of Mr & Mrs Parry, of Tirnanerch, Carrog, Corwen. Varennes Military Cemetery, France. 12261 1st Bn. Wellington Regiment, N.Z.E.F. 27 Sep 1916 33 Son of William & Margaret Roberts, of Carrog; husband of Annie E. Roberts, of Auckland, New Zealand. Dartmoor Cemetery, Becordel-Becourt, France. 204106 Royal Army Service Corps, attd. 25th Div. R.I.A.S.C. 17 Feb 1945 Son of Dr & Mrs John Chadwick Hindley; husband of Edith Deborah Hindley. Rangoon Cemetery, Burma. P/JX 247721 H.M.S. Hecla, Royal Navy 12 Nov 1942 22 Son of David & Mary Winiefred Thomas, of Carrog, Corwen. Sunk off Casablanca, Morocco. Portsmouth Naval Memorial, England.